Each year we look at who our top companies are by total donation amount and they are what we call our Cornerstone companies. The raise this money in a variety of ways including special events and fundraisers, employee donations and corporate gifts. 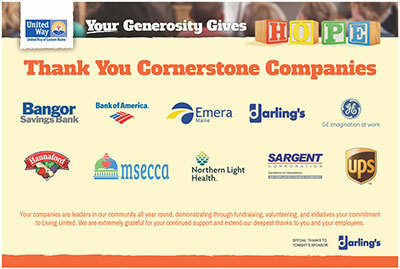 These Cornerstone companies make up more than 50% of our campaign every year and are a vital partner in the work that we do. These companies stand as pillars in our community all year round, not just at campaign time. They are the first to set up to volunteer, they host food and supply drives for many nonprofit agencies throughout our region and they sponsor countless events and opportunities. We could not be more grateful for their continued support and extend our deepest thanks to them and their employees.